The wavelength of emitted light grows, that is, the energy decreases, along the gold nanorod array. A Bose-Einstein condensate forms when an energy minimum of the lattice is reached. Credit: Aalto University / Tommi Hakala and Antti Paraoanu. Researchers at Aalto University, Finland, have created a Bose-Einstein condensate of light coupled with metal electrons, so-called surface plasmon polaritons. 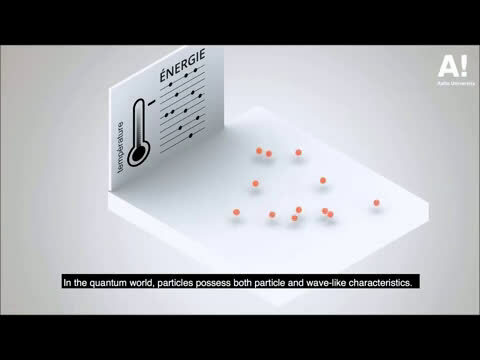 Nearly 100 years ago, Albert Einstein and Satyendra Nath Bose predicted that quantum mechanics could force a large number of particles to behave in concert as if they were only a single particle. This form of matter was called a Bose-Einstein condensation, and it wasn't until 1995 that researchers created the first such condensate of a gas of alkali atoms. Although Bose-Einstein condensations have been observed in several systems, researchers are pushing the limits of the phenomenon—to faster timescales, higher temperatures, and smaller sizes. As creating these condensates becomes easier, more exciting routes open for new technological applications. New light sources, for example, could be extremely small in size and allow fast information processing. Aalto researchers made condensed particles from mixtures of light and electrons in motion within gold nanorods arranged into a periodic array. Unlike most previous experimental Bose-Einstein condensates, the new condensate does not need to be cooled down to temperatures near absolute zero—because the particles are mostly light, the condensation could be induced in room temperature. "The gold nanoparticle array is easy to create with modern nanofabrication methods. Near the nanorods, light can be focused into tiny volumes, even below the wavelength of light in vacuum. These features offer interesting prospects for fundamental studies and applications of the new condensate," says Academy Professor Päivi Törmä. The main hurdle in acquiring proof of the new kind of condensate is that it comes into being extremely quickly. "According to our theoretical calculations, the condensate forms in only a picosecond," says doctoral student Antti Moilanen. "How could we ever verify the existence of something that only lasts one trillionth of a second?" Researchers at Aalto University, Finland are the first to create a Bose-Einstein condensate of light coupled with metal electrons, so-called surface plasmon polaritons. Credit: Aalto Univesity / Kalle Kataila, Antti Moilanen, Tommi Hakala, Päivi Törmä. 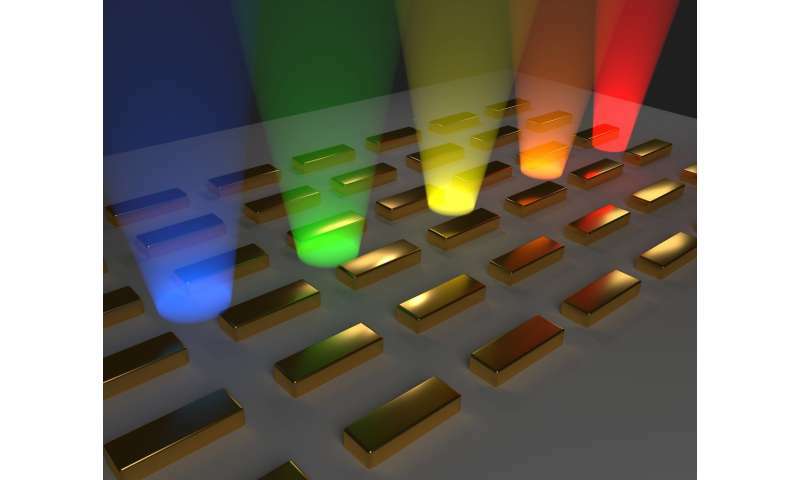 "As the condensate takes form, it will emit light throughout the gold nanorod array. By observing the light, we can monitor how the condensation proceeds in time. This is how we can turn distance into time," explains staff scientist Tommi Hakala. The light that the condensate emits is similar to laser light. "We can alter the distance between each nanorod to control whether Bose-Einstein condensation or the formation of ordinary laser light occurs. The two are closely related phenomena, and being able to distinguish between them is crucial for fundamental research. They also promise different kinds of technological applications," explains Professor Törmä. Both lasing and Bose-Einstein condensation provide bright beams, but the coherences of the light they offer have different properties. These, in turn, affect the ways the light can be tuned to meet the requirements of a specific application. The new condensate can produce light pulses that are extremely short and may offer faster speeds for information processing and imaging applications. Academy Professor Törmä is already exploring such prospects.